Paul Biya (born Paul Barthélemy Biya'a bi Mvondo, 13 February 1933) is a Cameroonian politician who has been the President of Cameroon since 6 November 1982. A native of Cameroon's south, Biya rose rapidly as a bureaucrat under President Ahmadou Ahidjo in the 1960s, serving as Secretary-General of the Presidency from 1968 to 1975 and then as Prime Minister of Cameroon from 1975 to 1982. He succeeded Ahidjo as President upon the latter's surprise resignation in 1982 and consolidated power in a 1983–1984 power struggle with his predecessor. Biya introduced political reforms within the context of a one-party system in the 1980s. Under pressure, he accepted the introduction of multiparty politics in the early 1990s. He narrowly won the 1992 presidential election with 40% of the plural, single-ballot vote and was re-elected by large margins in 1997, 2004, and 2011. Opposition politicians and Western governments have alleged voting irregularities and fraud on each of these occasions. Biya has maintained Cameroon's close relationship with France, Cameroon's former colonial ruler. Paul Biya was born in the village of Mvomeka'a in the South Region of Cameroon. He studied at lycée Louis-le-Grand, Sorbonne and Sciences Po Paris, where he graduated in 1961 with a diploma in International Relations. He married Jeanne-Irène Biya, who did not have any children, though she adopted Franck Biya who was born from a relationship of Paul Biya with another woman. After Jeanne-Irène Biya died on 29 July 1992, Paul Biya married Chantal Biya (38 years younger than himself) on 23 April 1994, and had two more children with her. Because Biya is a Christian from southern Cameroon, it was considered surprising that he was chosen by Ahidjo, a Muslim from the north, as his successor. 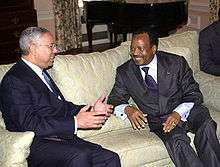 After Biya became President, Ahidjo initially remained head of the ruling Cameroon National Union (CNU). Biya was brought into the CNU Central Committee and Political Bureau and was elected as the Vice-President of the CNU. On 11 December 1982, he was placed in charge of managing party affairs in Ahidjo's absence. During the first months after Biya's succession, he continued to show loyalty to Ahidjo, and Ahidjo continued to show support for Biya, but in 1983 a deep rift developed between the two. Ahidjo went into exile in France, and from there he publicly accused Biya of abuse of power and paranoia about plots against him. The two could not be reconciled despite efforts by several foreign leaders. After Ahidjo resigned as CNU leader, Biya took the helm of the party at an "extraordinary session" of the CNU party held on 14 September 1983. In 1985, the CNU was transformed into the Cameroon People's Democratic Movement, in Bamenda the political capital of the north west region and Biya was elected as its President. He was also re-elected as President of Cameroon on 24 April 1988. Biya initially took some steps to open up the regime, culminating in the decision to legalize opposition parties in 1990. According to official results, Biya won the first multiparty presidential election, held on 11 October 1992, with about 40% of the vote; the second placed candidate, John Fru Ndi of the opposition Social Democratic Front (SDF), officially received about 36%. The results were strongly disputed by the opposition, which alleged fraud. In the October 1997 presidential election, which was boycotted by the main opposition parties, Biya was re-elected with 92.6 percent of the vote; he was sworn in on 3 November. In the October 2011 presidential election, Biya secured a sixth term in office, polling 77.9% of votes cast. John Fru Ndi was his nearest rival, polling 10%. Biya's opponents alleged wide-scale fraud in the election and procedural irregularities were noted by the French and US governments. In his victory speech, Biya promised to stimulate growth and create jobs with a programme of public works which would "transform our country into a vast construction site". On 3 November 2011, he was sworn in for another term as President. In February 2014, French citizen Michel Thierry Atangana was released from a makeshift Yaoundé prison where, under Biya's orders, he had been arbitrarily detained for 17 years under false claims of embezzlement because of supposed closeness to presidential candidate Titus Edzoa. Considered a political prisoner and prisoner of conscience by the United States Department of State, Amnesty International, Freedom House, and the U.N. Working Group on Arbitrary Detention since 2005, Michel was released under Biya's personal decree but the Working Group's tripartite demands remain unfulfilled as Michel remains un-rehabilitated, his assets frozen, and his persecutors un-prosecuted. 1 2 3 Profile of Biya at Cameroonian presidency web site (French). 1 2 3 4 5 Biography at 2004 presidential election web site. 1 2 3 4 5 6 Milton H. Krieger and Joseph Takougang, African State and Society in the 1990s: Cameroon's Political Crossroads (2000), Westview Press, pages 65–74. 1 2 3 4 5 Jonathan C. Randal, "Tales of Ex-Leader's Role In Revolt Stun Cameroon", The Washington Post, 15 April 1984, page A01. 1 2 John Mukum Mbaku, "Decolonization, Reunification and Federation in Cameroon", in The Leadership Challenge in Africa: Cameroon Under Paul Biya (2004), ed. John Mukum Mbaku and Joseph Takougang, page 34. 1 2 Elections in Cameroon, African Elections Database. ↑ "UK Home Office Immigration and Nationality Directorate Country Assessment – Cameroon", UNHCR.org. 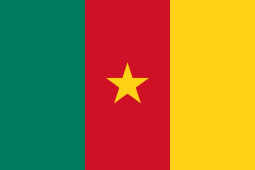 ↑ "Cameroun. Biya reinstalle", ANB-BIA, 3 November 1997. 1 2 "Cameroon's Supreme Court confirms Biya's re-election" Agence France Presse, 25 October 2004. 1 2 "President Biya is sworn in for another seven-year mandate." Archived 25 November 2009 at the Wayback Machine., Cameroonian government website]. ↑ "Cameroun: Paul Biya va modifier la Constitution", Panapress, 2 January 2008 (French). ↑ "Cameroun: adoption d'une révision constitutionnelle controversée", AFP, 10 April 2008 (French). ↑ "21 ANS DE TÂTONNEMENT", Camerounlink.net, 21 July 2007 (French). ↑ "Paul Biya réélu sans surprise à la tête du RDPC", rfi.fr, 22 July 2006 (French). ↑ "Cameroonian president wins vote, extending 29-year-rule". CNN. 22 October 2010. Retrieved 4 November 2011. ↑ "Court declares Cameroon's Biya landslide poll winner, despite accusations of fraud". Washington Post. 21 October 2011. Retrieved 4 November 2011. 1 2 "Cameroon's Biya promises youth jobs after poll win". Reuters. 25 October 2011. Retrieved 4 November 2011. ↑ "Cameroon: Biya sworn in for sixth presidential term". BBC News. 3 November 2011. Retrieved 4 November 2011. ↑ "Le Chef de l'Etat en séjour privé en Europe". Prc.cm. Retrieved 6 November 2011. ↑ "Le Président est de retour" (in French). Prc.cm. Retrieved 6 November 2011. ↑ "Anatomie eines Aufstandes: Dunkle Krawalle – Der Freitag" (in German). Freitag.de. Retrieved 6 November 2011. ↑ "Cameroon | Amnesty International Report 2009". Report2009.amnesty.org. Archived from the original on 8 October 2011. Retrieved 6 November 2011. ↑ "Cameroon defends Biya hotel bills", BBC, 3 September 2009 (French). ↑ The World's Worst Dictators. Parade.com (2011-10-20). Retrieved on 2011-11-08. 1 2 3 "CAMEROON: Author jailed for insulting President's wife". International PEN. 25 March 2011. Retrieved 21 April 2011. ↑ "Urgent Action:CAMEROONIAN WRITER HELD IN HARSH CONDITIONS" (PDF). Amnesty International. 12 April 2011. Archived from the original (PDF) on 10 January 2014. Retrieved 21 April 2011. ↑ "Cameroun: L'écrivain Bertrand Teyou Sort De Prison". camerpress.net. 2 May 2011. Retrieved 5 May 2011.